You know how I told you I have a medical condition called Chronic Project Doing with Manifestations of Pinterest-itis? If you forgot, you can read about it in this fascinating post. Well, I had a major flare-up this week when I saw a how-to article about making your own bitters. I didn’t know what bitters were, but they sounded fancy. They also sounded expensive, so I thought I might save a bundle by making my own. You know, to save money on something I wouldn’t have purchased anyway. It makes sense if you are afflicted with Chronic Project Doing. 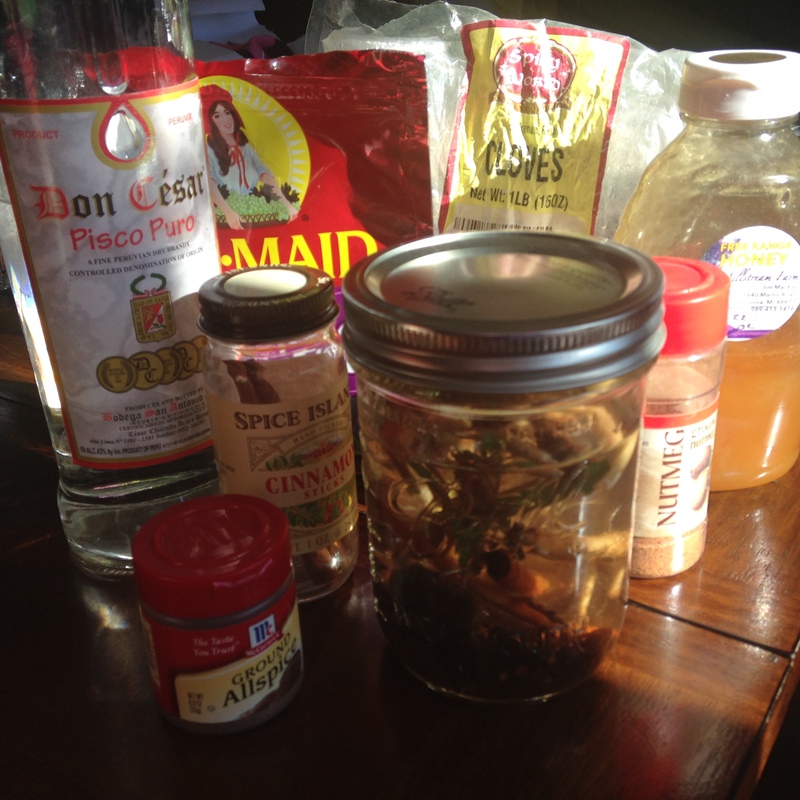 The most compelling reason I found to make bitters was that I already had the ingredients on hand. That’s a good reason to do something, right? Bitters, by the way, are solutions of strong alcohol infused with botanical ingredients and ideally something bitter. They can be used to aid digestion or to flavor a fancy cocktail. I already have a solid go-to for upset stomach, and I don’t make fancy cocktails, so you can see why I just had to make some bitters of my own. I looked around online for ideas and then I made up two recipes to try. 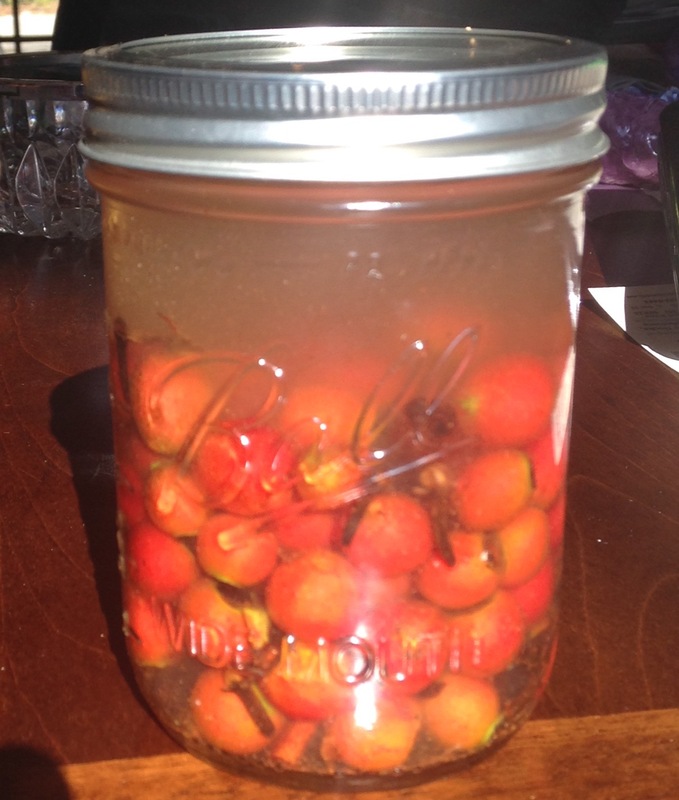 The first is called Christmas Rose and the ingredients are: rose hips picked from my yard, raisins, a dried fig, a cinnamon stick, nutmeg, allspice, cloves, honey, and pisco (that’s the alcohol, and yes it’s an odd choice but I had a bottle on hand from a previous random project). The second recipe is called Coffee Lion and it includes coffee grounds, dandelion roots dug from my lawn, vanilla, and pisco. At this point I should say again that I made these recipes up, I have no idea what I’m doing, and you should replicate this project at your own peril. And PS: digging up dandelion roots is hard labor, let me tell you. 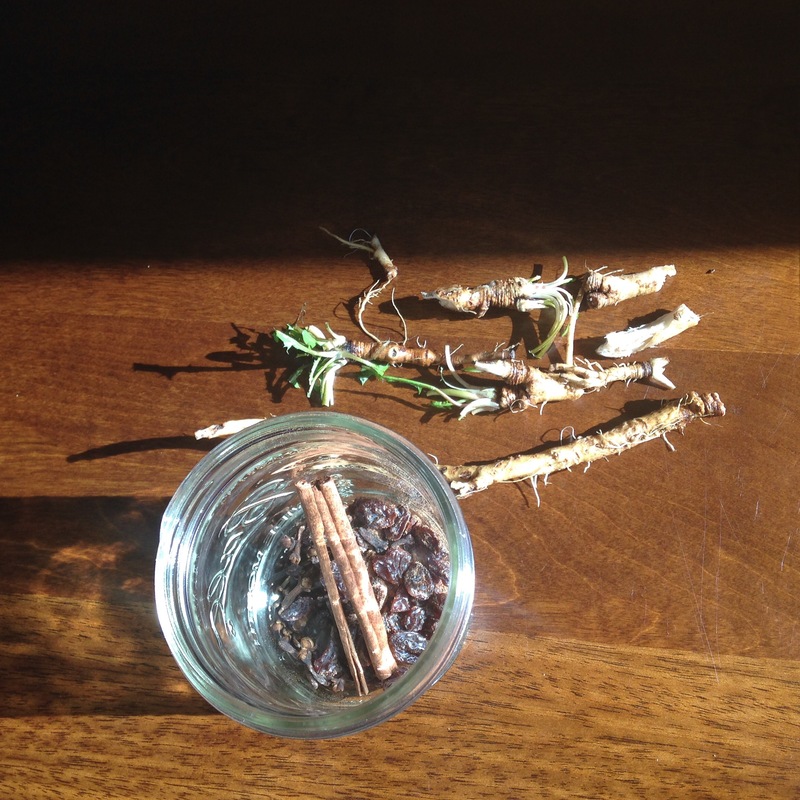 I scored the harder ingredients like the rose hips, dandelion roots, and cinnamon sticks by cutting into them with a knife. I thought this would allow the flavors to seep out more easily. Then I put the ingredients for each recipe in a jar and sealed it. And I shook the jars up until they looked like muddy pond water. I stashed them in a dark cabinet, and took them out once a day for a vigorous shaking. I am supposed to continue this for a month, at which time the ingredients should have had ample time to infuse their flavors into the alcohol. Then I will strain out the solids, and pour the resulting bitters into a new bottle or jar. From my internet research on this project, I’ve concluded that the most important part of making good bitters is bottling the liquid in a fancy container and making a stylish Martha Stewart-esque label. If you skip this step, your expensive bitters will just be a weird concoction that no one is willing to taste, even if they do have a tummy ache. Once your bitters are aged and bottled, you can display them in your personal bar. Oh, you don’t have a bar? You might not be fancy enough for bitters then. Please select another project to read about. I recommend this one about skinning a raccoon. So the question is: am I ever going to use these bitters, or will they just sit on my shelf looking mysterious and pretty? Probably the latter. But even if they just sit there looking pretty, I think these bitters will serve a good purpose. Imagine I meet some fancy people and they come over to my house. They might think I’m not in their fancy league because I have a bag of chicken feed on my porch, and there are silkworm cocoons lying around, and a flower vase made from an empty SPAM container. But then the fancy people walk into my kitchen and see a jar of bitters on the shelf, adorned with a handmade label. They’ll say, “I believe we’ve underestimated your fanciness, Jessica. Let’s be friends and celebrate with an exotic cocktail spiked with Christmas Rose bitters.” And then I will serve the cocktails in plastic cups and my new friends will leave. But I’ll still have you, right? I will be waiting, with great anticipation, to know if you have perhaps concocted bitters worthy of your tastebuds. Jessica loved this! Things have been tough lately so appreciate you making me smile! Bitters, bitterly brandished by bottling, become blatantly brave barely bothered by bars bedecked by brigands bouncing blithely by.